The history of this form of human body-art (decorative body modification) called “tattoo” began thousands of years ago and is as diverse as the people who wear them. These permanent designs—sometimes plain, sometimes elaborate, always personal—have served many functions: amulets, status symbols, declarations of love, signs of religious beliefs, adornments, and even forms of punishment. In Japan the art of Tattooing may go back to the early stone-age, from 750,000 to 15,000 years ago. Other cultures have had their own tattoo customs, for example: pricking their skin on their hand to insert dyes. A) Search for tattoo designs or category on internet to get some good and quality design of tattoos. 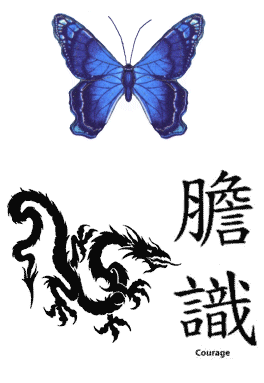 B) You can try to put temporary tattoo design before get a permanent tattoo on your body. C) Ask your tattoo maker about tattoo removal and is it possible to make or change tattoo work from your body. D) Make sure you don't have any skin allergy or skin problem. If you had then you need to tell to your tattoo designer. E) Make sure your tattoos artiest have good knowledge of tattoos work, safety and health care information. You may want tattoo ideas depending on what kind of designs will suit your gender and style. NOTE: A growing popularity in choice for men has been tattoo ideas spreading over both shoulders and shoulder blades. This involves incorporating different designs into one, mural like, unique tattoo. This is a good tattoo choice because you're telling a story. Each tattoo can represent something important to you and the sum of all the tattoos placed together represents your life at the time or all the ideals you hold true as an individual. A great way to develop a mural tattoo is by going through an online tattoo catalog or collection and looking at all the various designs, while setting aside your favorites for potential inclusion into your mural.